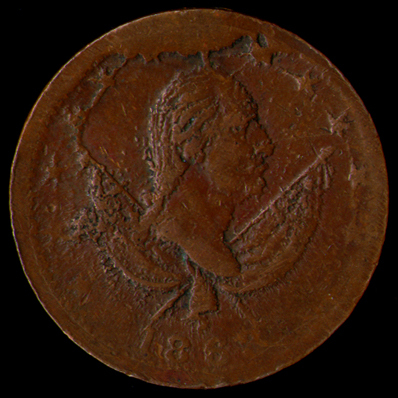 Comments: The obverse displays an undraped bust right portrait of Washington with crossed American flags in the background and thirteen stars around the border and the date in exergue. This die was rather poor, the stars on the right side were weakly cut and are usually very weak on the token. In a second less circulated example in our collection the area is even more weakly struck. Click here for that image at 500 dpi and 250 dpi. Also note both examples exhibit a die break near the rim between the fourth and fifth star. In these early examples the break is small so that the damaged area is limited to where the rim moves into the beaded edge. In a well worn copper example in the collection the die break has become much larger, taking most of the upper area and reaching down to Washington's head. On the left it also moves through the stars to the top of the flag. 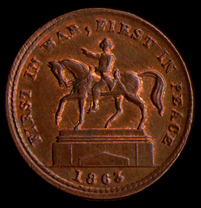 Click here for images of the copper obverse at 500 dpi and 250 dpi. 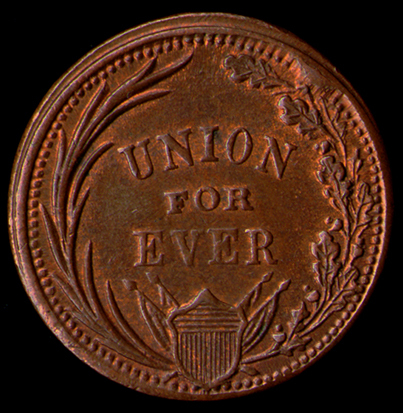 This obverse is not listed with any other patriotic reverse in Rulau's first edition of the Standard Catalog (see p. 377). The reverse displays the legend EXCHANGE within a wreath consisting of an olive branch to the left and an oak branch to the right with a military trophy below including a drum, crossed cannon and crossed rifles. The reverse is more weakly struck at the right side of the oak branch. For the reverse of the second brass example click here for the 500 dpi and 250 dpi. images. For the reverse of the worn copper example click here for the 500 dpi and 250 dpi images. 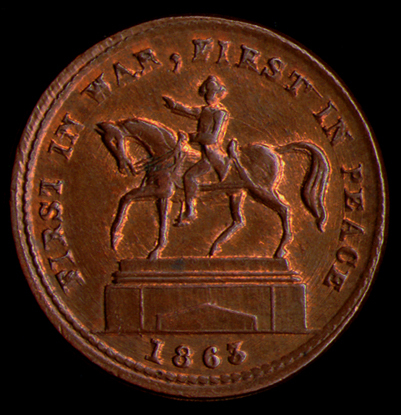 Comments: The obverse displays an equestrian statue of Washington facing left, based on the monument by sculptor Henry K. Brown which was unveiled on July 4, 1856 in Union Square, New York City. There were several patriotic obverses depicting this statue. Obverse 174 can be distinguished from the similar patriotic obverses 173 and 176 in that it has a smaller sized date. 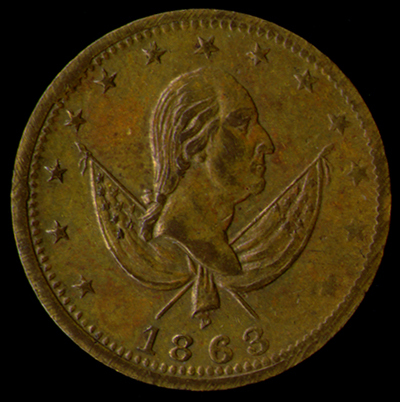 According to Rulau's first edition of the Standard Catalog (see p. 377), this obverse was combined with patriotic die 272, there are also a few examples of very rare combinations with patriotic dies 189 and 233 (233 is also called storecard die 1237). The reverse displays an open wreath with a palm branch to the left (symbolizing peace) and an oak branch to the right (symbolizing war) at the bottom of the wreath is an American shield with crossed flags behind. 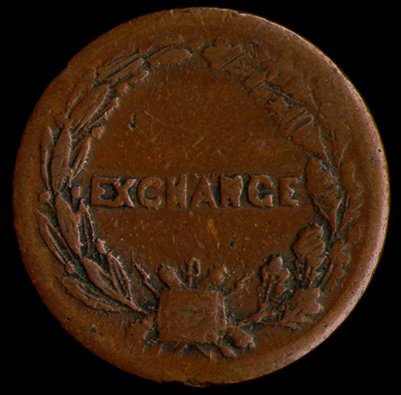 This is patriotic die 272, which is quite similar to patriotic die 271 (also known as storecard die 1246). 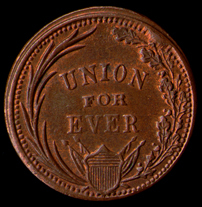 An example of die 271 can be seen on the following token. The two dies can be distinguished by the difference in the oak cluster. In die 272 there is no acorn near the tip of the closest flag (the wreath begins with a cluster of two leaves, then a cluster of three leaves, an acorn to the right and then a cluster of two leaves); in die 271 (1246), shown below, there is an acorn near the tip of the closest flag (the wreath begins with an acorn to the left, a cluster of two leaves, another acorn to the left, a cluster of two leaves then an acorn on each side). The shields are also quite different; die 272 contains six prominent raised vertical stripes while the shield in die 271 has twelve rather thin raised vertical stripes. Also, die 272 displays a die break at the tip of the shield moving upward toward the right. Finally the legend is rather bold on die 272 while on die 271 the letters VE in EVER are weakly struck. References:Reference: Rulau, Standard Catalog of United States Tokens, 1st ed., p. 377; 2nd edition, pp. 413 and 424 for the obverse and pp. 416 and 425 for the reverse. 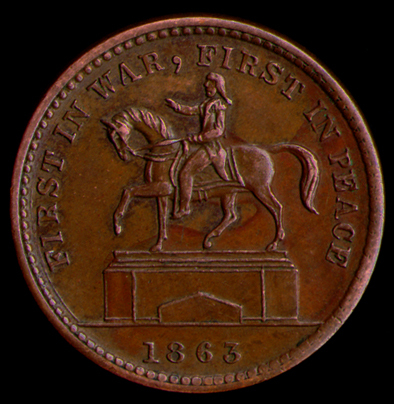 Comments: The obverse displays an equestrian statue of Washington with his head turned facing the viewer, based on the monument by sculptor Henry K. Brown which was unveiled on July 4, 1856 in Union Square, New York City. There were several patriotic obverses depicting this statue. 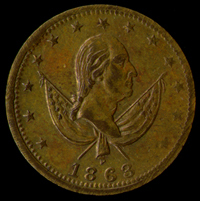 Obverse 177 can be distinguished from the similar patriotic obverses, as 174, in that obverse 177 has a arched date that follows the beaded edge rather than a date that goes straight. Also the portrait of Washington is less distinct and seems to face the viewer rather than looking forward. Also the letters in the legend are smaller with several less distinct, for example, note the broken top on the T in FIRST. 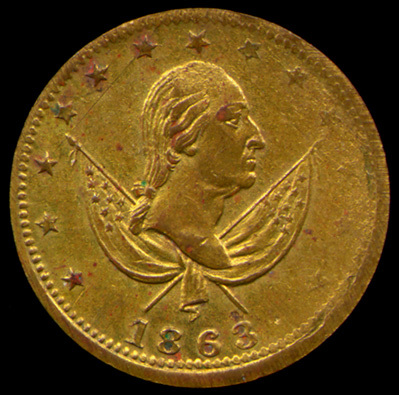 According to Rulau's first edition of the Standard Catalog (see p. 377), this obverse was combined with patriotic dies: 271 (storecard die 1246), 294 (storecard die 1244), 295 (storecard die 1245) and 432 (storecard die 1275). The reverse displays an open wreath with a palm branch to the left (symbolizing peace) and an oak branch to the right (symbolizing war) at the bottom of the wreath is an American shield with crossed flags behind. This is patriotic die 271, which is quite similar to patriotic die 272 (also known as storecard die 1246). 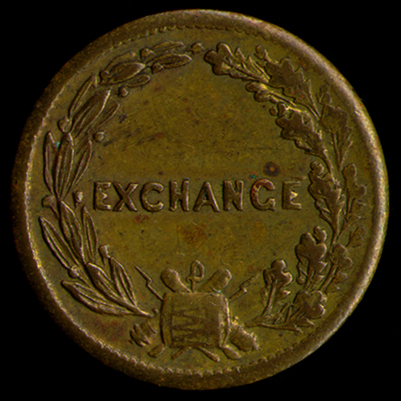 An example of die 272 can be seen on the previous token. The two dies can be distinguished by the difference in the oak cluster. In die 272 there is no acorn near the tip of the closest flag (the wreath begins with a cluster of two leaves, then a cluster of three leaves, an acorn to the right and then a cluster of two leaves); in die 271 (1246), shown below, there is an acorn near the tip of the closest flag (the wreath begins with an acorn to the left, a cluster of two leaves, another acorn to the left, a cluster of two leaves then an acorn on each side). The shields are also quite different; die 272 contains six prominent raised vertical stripes while the shield in die 271 has twelve rather thin raised vertical stripes. Also, die 272 displays a die break at the tip of the shield moving upward toward the right. Finally the legend is rather bold on die 272 while on die 271 the letters VE in EVER are weakly struck. 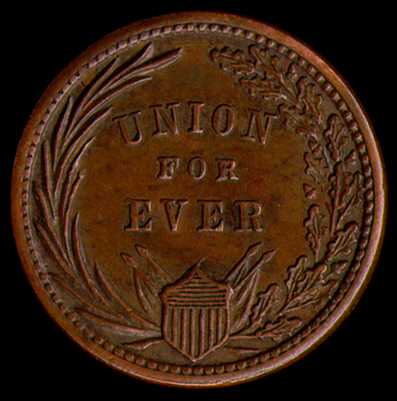 References:Reference: Rulau, Standard Catalog of United States Tokens, 1st ed., p. 377; 2nd edition, pp. 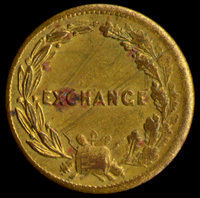 413 and 424 for the obverse and p. 425 for the reverse. Also see Fuld, U.S. Civil War Store Cards, 2nd ed., p. xxxviii where ther reverse is illustrated as storecard die 1246.